I would apologize for yet another extended blog-absence, but since I was spending time with family, I can’t say I’m sorry. And with a view like this how can I say I would have rather been staring at a computer screen? Our little Thanksgiving vacation was truly perfect- a chance to disconnect from electronics and just share some quality time with my favorite people. The icing on the cake was our Thanksgiving meal- curried sweet potatoes, roasted brussels sprouts + carrots, vegetarian stuffing, pumpkin tiramisu and so much more. I’ll dedicate some future posts to a few of the recipes we made because they are definitely worth sharing. 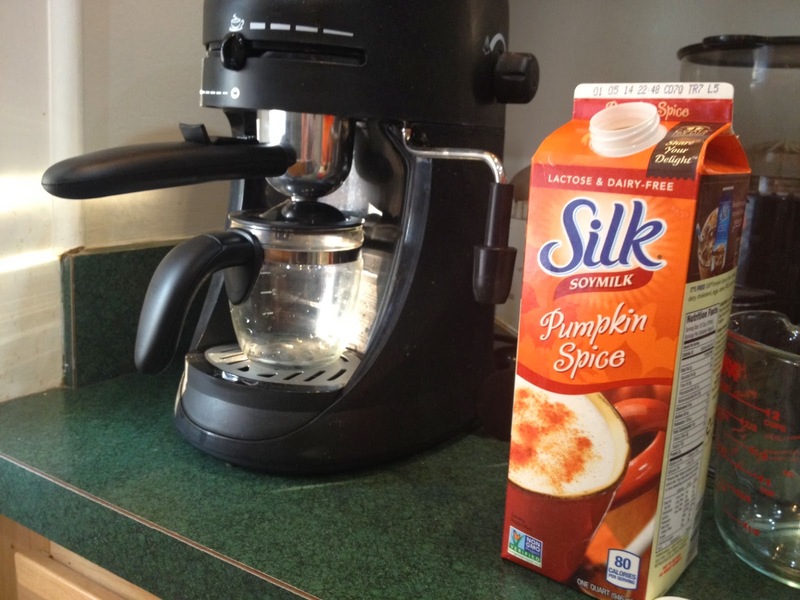 While on a mission for some Silk Nog, my favorite seasonal beverage, I spied this little beauty. I imagined that it would be delicious on its own but would be put to even better use when steamed and mixed with espresso. And oh boy was I right! Breakfast of champions. 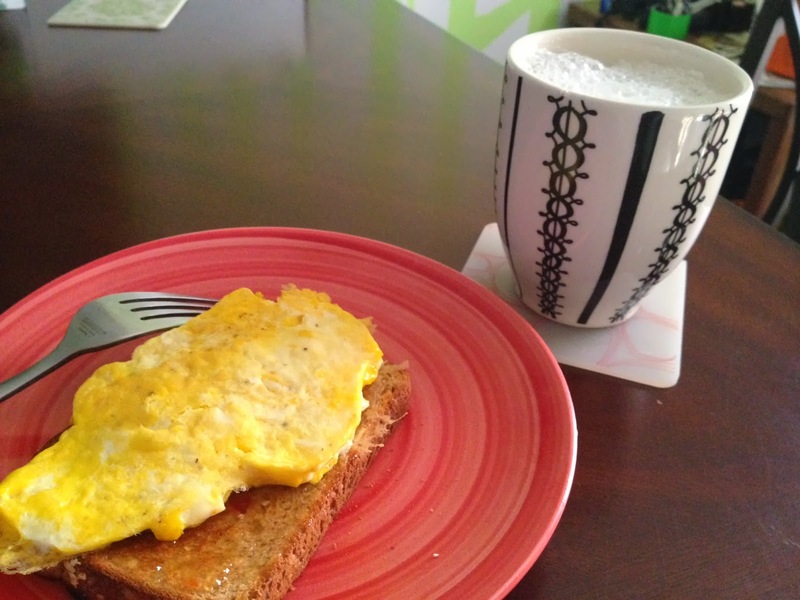 Eggs on toast with hot pepper jelly and a pumpkin spice soy latte. If that won’t help the post-vacation blues then nothing will! Question for the masses (because I know my reader base is HUGE): how do we feel about holiday runs? I have been debating signing up for a 5K, preferably on New Year’s day. I like the idea of starting the 2014 off on the right foot, so to speak, but I find the pricing of these things to be outrageous. I know that I could very easily wake up nice and early on January 1st and run 3.1 miles on my own but something about an organized race just seems a bit more exciting. I’ll also admit that part of my desire to fork over the cash is to kind of force myself to keep it in check- no overindulging on NYE and no excuses when my alarm goes off the next morning (even though this race does boast a very sleep-in friendly 11a start time) because I wouldn’t want that money to go to waste. Is it wrong to use the external motivation or should I just run with it (bad pun intended) and do what I need to do to help guarantee a good start to 2014? I LOVE holiday races. Nothing lets me load up more turkey than a turkey trot on thanksgiving day, and a 8k or half marathon is even better. New Year's resolution runs are lots of fun, since all you have to do for the rest of the day is watch football. Go for it. I find it very hard to get motivated and get in a decent run during the holiday season. So I find an organized race helps even if it is a bit of money. I do agree, it just seems more exciting and fun.